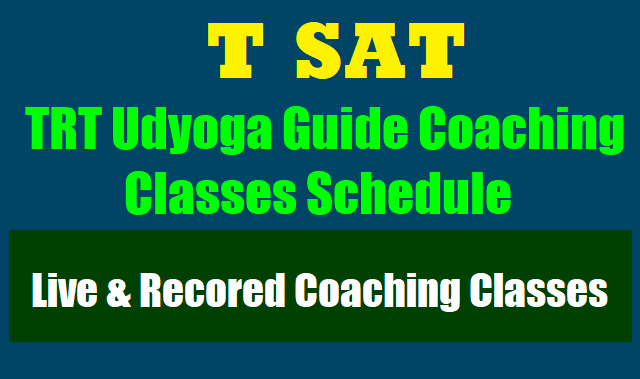 80 Days T SAT TRT Udyoga Guide Coaching classes for Tspsc Teachers Recruitment 2017/Telangana’s T-SAT to telecast coaching classes for Teacher Recruitment Test: Mana TV Gurukula Udyoga Guide classes for TSPSC Teachers Recruitment, MANA TV live coaching classes for TSPSC Teachers Recruitment, Mana TV Training Programmes,SoFTNET MANA TV CH-1& CH-2 Telecast schedule for GURUKULAM UDYOGA GUIDE: Gurkula Udyoga Guide, MANA TV Gurukulam Teachers Recruitment Training Classes, MANA TV Live Classes for TSPSC Employment Recruitment. Gurukula Udyoga Guide would be telecast daily from 14-12-2017 by 10 hours. T SAT/Mana TV to telecast coaching classes as Gurukula TRT Udyoga Guide for ‘Gurukul’ Recruitment exams from December 14, 2017: The Telangana State-run education channel, Mana TV will telecast coaching classes for ‘Gurukul’ Teachers Recruitment examinations to help students from rural and financially backward families. Appearing for the Teacher Recruitment Test (TRT)?.. Then these training classes on the T-SAT Nipuna can help you in cracking the re-cruitment test. Starting December 18, Society for Telangana State Network (SoFTNET), which operates T-SAT Nipuna channel under Department of Information Technology, Electronics and Communication, will telecast °MT Udyoga Guide', a training programme for candidates aspiring to become a teacher. The subject-wise audio-vi-sual content will be on air from 7 am to 10 am and 5 pm to 11 pm on T-SAT Nipuna and the same content will be repeated next day on T-SAT Vidya. This apart, candidates can also clarify their doubts during an interactive pro-gramme with subject ex- perts between 4 pm and 5 pm on both the channels. Addressing a press con-ference here on Wednes-day, R Shailesh Reddy, CEO, SoFTNET, said from December 14, programmes on how to register for the ex-amination and syllabus among others would be tele-cast and content for prepa-ration will be on air from December 18. SOFTNET Vision: To Educate, Enlighten and Empower the people of Telangana State using audio-visual, wire & wireless technology and Satellite Communications to achieve Bangaaru Telangana. To take the best of the faculty into every classroom, make learning easy, build a mentally strong, morally high and well informed student community, in sync with the trends across the globe. To provide quality coaching and guidance for aspirants seeking admission to professional courses. To help the young and educated with right guidance to employment, coaching to competitive exams, vocational training and skill development. To help government departments train its workforce and enable them deliver services with perfection and precision. To help the masses come close to the government and obtain its services at the door step, free from corruption and on time. To build a secure Telangana by creating awareness among its people on safety & security, prevention of crime and participation of people in maintaining law and order. The televised coaching classes, aimed at students from rural and financially backward families, will be telecast twice a day, with the first episode to be aired from 6 a.m. to 8 a.m. and the second episode to be aired from 5 p.m. to 7 p.m. Mana TV live programmes were being launched to provide quality education to students from economically backward backgrounds. Mana TV will also telecast a live programme from 3 p.m. every day, where candidates appearing for the competitive exams can call and clarify their doubts and a repeat telecast of best classes for that week would be aired on Sundays from 10 a.m. to 4 p.m. The MANA TV live coaching classes for candidates preparing for IIT, NEET, EAMCET, which started on January 1 would be paused till March 15, due to practicals and intermediate examinations for students. The classes, which have been pre-recorded, were conducted by experts in the field of competitive entrance coaching. According to the TSPSC, there are nearly 13 lakh unemployed graduates in our Telangana State and SOFTNET aim is to offer the best coaching to them so that they can get a job.